I recently made a trip to Chatham County, North Carolina to do research, along with one of my distant cousins that I've met through genealogy. 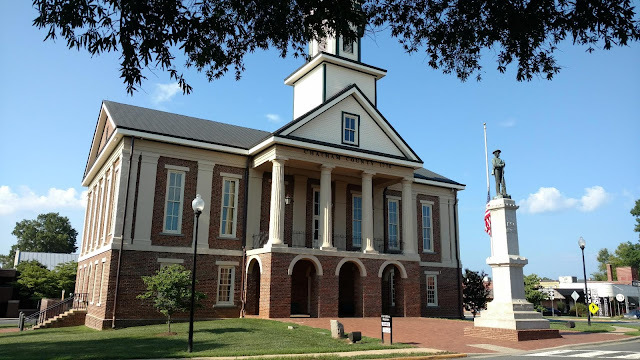 We met in Pittsboro, an historic little town with a beautiful old courthouse, built in 1881, sitting right in the middle of town, with a traffic circle around it, used as a museum, and rightly so. Chatham makes my 33rd county I have visited to have tracked family either to or from. Why I waited so long, I am not certain, as several families from the Stanly/Montgomery/Anson County area, where my ancestors all landed, resided in Chatham for awhile before migrating westward here. My Marks and Murray lines most definately and my Ramsey and Lambert lines possibly. So far, I have had the priviledge of visiting the courthouses, museums, libraries and history centers of Stanly, Montgomery, Anson, Cabarrus, Union, Mecklenburg, Rowan, Iredell, Burke, Davidson, Randolph, Davie, Guilford, Forsyth, Wake, Moore, Hoke, Cumberland, Brunswick Counties of North Carolina and Marlboro, Chesterfield, Chester, Lancaster and York Counties of South Carolina; Mecklenburg, Brunswick and Luneburg Counties in Virigina; Lauderdale, Limestone and Lawrence in Alabama; and White and Lumpkin Counties in Georgia. How I missed Chatham in all of that, I do not know. Chatham is a beautiful place with rolling hills and wide streams. It's difficult not to wonder why ancestors left there and came here. We live in a beautiful area, too, but in Chatham, you get the feeling of "Why leave"? The Marks brothers lived here and it was also home to ancestors Isham and Esther (Hester) Gunter, whose daughters Mary and Catherine "Caty" Gunter married the Marks, John and James. The most prominent Marks was William, who we know married Margaret Salter from Bladen County. We know that there must be a link between John, James and William. They were most likely brothers, but we've not found proof of that yet. We also found a George Marks, and from a land division, we know he married into the Kennon family, but he made a brief appearance, in the 1800 census and in the land division, and then he disappears. Where did he go? It might be of interest to research his wifes family to see if he followed them west. It's a constant search for dna matches to see if we can tie all of these folks together. But perhaps the most astonishing find my cousin and I made was found in a deed. My cousin and I had been functioning on the presumption that John Marks had married Caty Gunter, as both of them show up in Stanly/Montgomery County, in ledgers, petitions and Caty is in the 1830 census. John was in Montgomery/Stanly as late as 1837. James never does. And Mary Gunter Marks lived a long life in Chatham. But this deed broke that theory in two, clearly showing that John was married to Mary, not James. It also explains why Caty is alone in 1830 and why John shows up in Chatham up until 1840. When I line up the 1800, 1810 and 1820 census records with the suspected children of each couple, it also makes more sense that the couples were John and Mary and James and Caty. Chatham County was formed in 1771 from Orange County. It was named in honor of William Pitt, the First Earl of Chatham. The county seat, Pittsboro, was also named for the Pitt family. Some of the earliest settlers in the area were Quakers. A large Quaker settlement established itself in the area of Siler City about 1751, two decades before the county was established. Early Settlers arrived to Chatham from the north, following a Catawba Indian trading route south through the Cape Fear Valley. 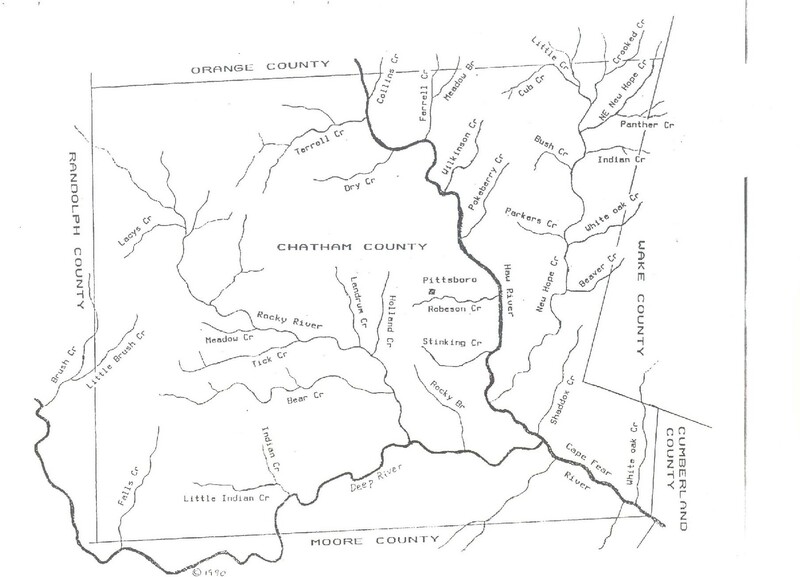 Chatham was a virtual Eden of Waterways. It contained not one or two, but 5 major waterways. First, there was the Haw River running from the north central part of the county to the beginning of the Cape Fear River. Then there was Deep River, coming in from the South and West through Randolph and Moore Counties to join the Haw River and become the Cape Fear. Then of course, the Cape Fear in its Southeastern corner. Then there was the Rocky River, whose many contributaries, including Bear Creek, that fanned out over the western half of the county and became a contributary of the Deep River and on the eastern side of the Haw River was New Hope Creek and all of its contributary branches, reaching the Haw just before it's union with the Deep and creating a water coverage for the county's Eastern border. New Hope became Jordan Lake and covers nearly 14,000 acres. But in the early days, the abundance of water and waterways made Chatham an attractive destination. It was a hotbed of activity during the Revolution and that may have been why many families left and relocated in along the Yadkin/Pee Dee instead. One bit of information I picked up in Chatham was the influx and influence of the Argyll Colony, a group of Scots who arrived in Brunwick and Wilmington and made their way to the Cape Fear Valley to Cross Creek (which later became Fayetteville) in present day Cumberland County. A generation later, they would make their way up the Cape Fear, to its origin in Chatham. This interests me in particular, because several of my family lines that originated in Chatham, or may have originated in Chatham, like the Murrays, Ramsey's and Lamberts, have Scottish origins. Among the other treasures I discovered in Chatham was the 1815 tax list. Why would someone get excited over a tax list, you might ask? Well, it was who was found on it. And there were many. In the early pages, I kept seeing the name of a person with adjoining propert as "A. Carloss". I gasped. "Archelaus Carloss", I muttered, just wondering, and I few pages later my wondering ceased. I was right. It was indeed Archelaus Carloss, the younger. He had landed in Chatham County and made a comfortable home for himself. I became acquainted with the Carloss family in my research of my Southside Virginia families of Davis, Winfield, Freeman and Floyd. Two sons of Edward Winfield and wife Mary Harris , Peter and Joshua, had married two sisters, Charlotte and Jemimia Freeman, daughters of Arthur Freeman and wife, Agnes Stokes. 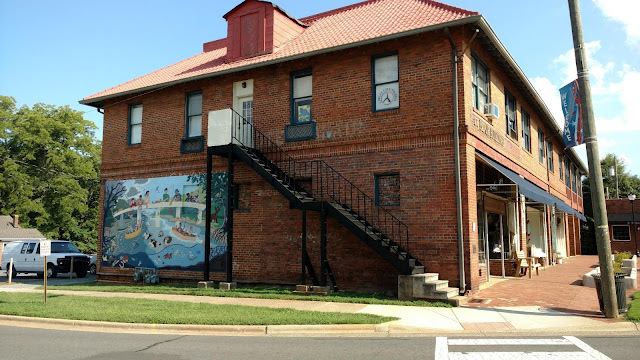 Peter and his wife Charlotte would migrate to the Rocky River area of Anson/Montgomery/Stanly County along with many friends, relatives and neighbors, including Stokes, Freemans, Laniers and Marshalls. Joshua remained in Virginia. When his first wife, Jemima Freeman Winfield died, Joshua remarried to Rebecca Thrower Carloss, daughter of Hezekiah Thrower and widow of one Edward Carloss. She came as the mother of two young sons, Robertson (or Robinson) and Archelaus. When the large group of Virginians set forth to Anson County, NC, it included Joel Winfield, son of Joshua and Jemima Winfield, John Thrower Winfield, his half-brother, son of Joshua and second wife Rebecca and Robertson Carloss, Joshua's stepson and stepbrother to Joel and half-brother to John Thrower Winfield. Three daughters of Joshua also migrated, Dorothy, who married a Walker, Mary, who married Drury Robertson Jr and Martha, who married James Robertson, sons of Drurry Robertson, Sr.
After about 10 or 12 years, the younger generation crossed the state line into Marlboro County, SC. Joel Winfield would make his mark in politics, operate an Ordinary and establish his own little town of "Winfieldville" which would morph into Bennettsville. When he died, John T. Winfield took over his duties for awhile as Postmaster and such, but would eventually migrate on to Charleston. The Robertson brothers with their Winfield wives would become sucessful planters and businessmen while their wives would be the hostesses of Marlboro society. Robertson Carloss would not create as many waves as his stepsiblings, but became a land owner. But I often wondered what became of Archelaus. Now I know. John Jr. b 1729 in New Kent, Va. , found in Dinwiddie and Brunswick Counties of Virginia and later, Edgecomb and Franklin Counties in North Carolina. Edward (b about 1840, lived in Brunswick County, Virginia. Married Rebecca Thrower, daughter of Hezekiah Thrower, father of Robertson Carloss and Archaelus II. The 1815 Tax List of Chatham lists Archelaus as being taxed for 1 white poll and 3 black polls. He owned 1275 adjoining Joseph Buchanon, a town lot in Haywood adjoining Joseph Lane, two uninproved (vacant) town lots in Haywood adjoining Theopas Hunter, and as Guardian of Hannah Stokes, another unimproved town lot in Haywood. The community of Haywood is shown in Haw River township near the birthplace of the Cape Fear. The story of Hannah Stokes is an interesting one and made the history books. It also brings into play my Stokes relatives. Sylvanus Stokes was born about 1660 in Charles City, Virginia and died February 6, 1748 in Sussex County, Virginia. He married Agnes Hamblin and among his many children was a son name Hamblin Stokes, born in 1683. Hamblin Stokes married Cecilia Walker and named one of his daughters Agnes, born in 1720, after his mother. Agnes Stokes married Arthur Freeman and they were the parents of Charlotte Freeman Winfield and Jemima Freeman Winfield and many of their children and grandchildren would migrate to North Carolina. Sylvanus Stokes was my 8th Great Grandfather. He would spur off many younger Sylvanus Stokes, a son, multiple Grandsons and Great Grandsons. Some of these descendants ended up in Chatham County. Thomas Stokes of Chatham County, NC died in the year 1811 leaving three sons, William B. Stokes, Sylvanus Stokes (one of a hive), and administration of his estate was left to Archlaus Carloss. He died intestate, meaning he did not leave a will. His oldest son, William B. Stokes, was a young man and had recently married. He died shortly after his father. He left a widow and a little girl. The little girl was Hannah and was about 3 years old when she came under the guardianship of Archelaus Carloss. Hannah grew up in the care of Archelaus Carloss, but during some point, also lived with her mother, who remarried, but Archelaus was still in charge of her estate. On January 2, 1824, she married Robert Carloss, a son of Archelaus. The young couple had 3 children in 3 years and then Robert passed away. Life expectancy was not very high in those days. In October of 1830, she remarried to one George H. Shutt and they filed a bill against Archelaus Carloss in March of the next year. Their complaint was this, according to a North Carolina law, a girl under 15 was not allowed to marry without permission from their father. As Hannah's father was dead, that permission was impossible. The couple complained that since Hannah was born on March 14, 1810, she had not yet reached the age of 14 when she married Robert Carloss. They accused Archelaus Carloss of having arranged the marriage to the benefit of his son, who owned little on his own, in order for Robert to obtain his wifes inheritance and assets. The Shutt's claimed Robert blew much of the money and lost a great deal of the rest to debts, and that after his death, the rest had reverted to his father, being the heir of his son. Archeleus had a significant amount of property of his own and Hannah intended to retain that which was hers, on the basis that she was forced into marriage below the legal age for the benefit of the Carlosses. In his defence, Archelaus gave an account of his appointment as the adminsitrator of Thomas Stokes, as it was recorded in the Chatham County court records, and on the petition of Jordan and Sylvanus Stokes, Hannah's uncles, it appeared that he was due a balance of over $700 and that the account was true and just. He had settled in full with Jordan and Sylvanus, and upon his death, William B had no property or assets, save the inheritance from his father, and was very much in debt. He had also settled in full with Hardy Christian and his wife Ruth, Ruth being the widow of William B. Stokes and the mother of Hannah. He claimed that after Hannah's marriage to his son, he had delivered the balance of her inheritance to Robert, as was the law of the times, and that his guardianship and administrative duties had ended. He also claimed that at the time of the marriage, he did not know that Hannah was under 15, and neither did his son, her being a "well-grown and stout young woman". Much of the trial was based on proof or disproof of that last part. Did or did he not know Hannah was under age. The defence asked a number of witnesses, "Was not Hannah Stokes a large and uncommonly well grown girl before her intermarriage with Robert Carloss?" The justice of the peace who married them stated, "She had size enough for an ordinary woman, but in most other appearances looked quite young". Another claimed, "I think I recollect her weight and it was 118 lbs". (Who was weighing her and why?) Yet another stated, "She was very 'taul' for her age and tolerable well grown. So, it looks like Hannah was tall, healthy and mature for a 13 year old. Having came from the upper classes, she was no doubt well-fed. Having 3 infants immediatley after marriage in rapid succession testifies to the fact that she was healthy and mature for her age. But having arrived in Archelaus's care at the tender age of 3, I hardly can believe he didn't know how young she was. At any rate, he won. The judge stated, "It does not appear to this fact nor known either to the father or the son", meaning the judge sided with Archelaus that neither he nor Robert knew Hannah was under 15. He devised that Hannah had also spent some time living with her mother and stepfather and implied that Ruth approved of the marriage, but Ruth denied this in trial. In the same district as Archeleus was the property of this Sylvanus Stokes, even larger than that of Archelous, with over 20 properties totaling 4703 acres, including town lots in Haywood. But the treasures did not end there. There were several Pilkentons in Farrar's district. Possible ancestors as it is thought Isham Gunter was married to Hester (or Esther) Pilkenton. There was a Benjamin Murray living in Smith's District. Was he related to my ancestor Jesse Murray, who was from Chatham and shows up in Anson in 1820 and in Stanly (West Pee Dee, Montgomery) in 1830? His two sons were named James and Benjamin. Also in Smith's district was John Lambert, pegged by many to be our Stanly County Lambert progenitor, Rev. John Lambert, who makes his first appearance in the 1830 census of Stanly. This John Lambert was the son-in-law of Henry Bray, a prominate Chatham citizen, but was he our John Lambert? We find James Marks in Brantley's district with one poll, himself, but so was Richard Kennon, who estate names a son-in-law, George Marks. We found that most of our Gunter kin lived in Captain Cotten's district, which according to the map was right around, and to the south of, Pittsboro. We discovered that Isham Gunter, our known ancestor, lived on Stinking Creek, adjoining William Marks. William Marks married Margaret Salter of Bladen County, not one of Isham Gunter's daughters, as John and James did. This really suggests a close connection between the three Marks. We found that the Marks: William, John and James (I so have an urge to call them the Marx brothers.) served quite often on juries and that John was listed as insolvent in 1806. I discovered my ancestor, Jesse Murray, was indicted for Assaut and Battery in 1809, but was later found not guilty. The prosecuting witness, William Mince, was to pay all court costs. There were records of migrations to and from Chatham, with a number of Murrays who were from Augusta County, Virginia, buying land in Chatham before thier settlement. There were Ramsey's from Augusta County Virginia migrating to Anson and Mecklenburg Counties, which suggests these two sets of Ramsey's were related. I discovered that in addition to all of the familiar sounding names (some undoubtedly the same individuals found in Virginia previously, or Anson records, later. ), there was one poor guy named "Green Flowers". Why couldn't Green Flowers have been my ancestor. He would be much easier to trace down than "John Lambert". (He could be related as it was said my ancestor (or his father of the same name, also an ancestor, William McGregor, married a Flowers). But one of my favorite discoveries, besides the mind-blowing fact of John Marks being the husband of Mary Gunter, was a Deed, book D, page 613 between Isham Davis and one Joseph Bell. Isham Davis of Halifax County, to Joseph Bell of Chatham, a tract lying in Chatham, beginning at Sugar Tree "gut', granted by deed to Benjamin Clemmons by the Honorable Lord Earl Granville, and bordered the Haw River. Not a big deal in and of itself, but it was the testators: John Long, Edward Jordan, Sterling Wright and.....Silvia Wright. I know them!!!! These were more of my Virginians. Silvia Davis was the youngest child of my ancestors, Henry Davis and wife, Mary Marriott Davis. They lived in Surry County, Virginia, but most of their children had ended up and Mecklenburg and Brunswick Counties in Virginia. Not Mecklenburg OR, but Mecklenburg AND Brunswick, lining up along Taylors Creek with the Winfields and Floyds, straddling the county line, the county where my Job was born on April 10, 1773. Silvia was his AUNT, Sterling and Silvia Wright were my GGGGGGGG Aunt and Uncle!!! Silvia was a minor when her father died and Joshua Winfield, my GGGGGGGG Uncle, mentioned earlier, had been appointed her guardian. There may have been more than one Isham Davis, but there was only one Sterling and Silvia Davis Wright. So, this meant Isham had to be my GGGGGGG Uncle Isham Davis. If Isham had lived in Chatham and Halifax, did Job and Mary Tillman Floyd, his first cousin, pass through there on the way to Stanly County? Did they tarry there? Did they even live there for awhile? I looked into Isham a while back and most folks had him going off to Kentucky, but it looks like that was the wrong Isham Davis. At any rate, it was a very fruitful trip. Bye Chatham! What other surprises will you hold for me in the future? Love Chatham County - such a beautiful area! What other surprises does Chatham hold in the future? Can't wait to find out!